Ahggg this has been sometime coming, but after many ppl having asked in the past for clarification on some of the terms used in papers that also appear in more technical threads from time to time. Iv run this very rough and basic list (with picture guide) up that i hope will be of some use to someone at sometime. Bare a few things in mind before reading this, Disclaimer I am a non taxonomist type and if you should find any big mistakes in the following please correct them . Down the middle of the body, or the middle of a limb of limb segment. Pretty simple and basically the front and back half’s of the body respectively but can also be applied to front and back of a body section, here arrows show the anterior and posterior of both the cephalothorax and abdomen (the arrows also follow the medial line of the body parts in question). These two are very commonly seen in scientific work’s and despite being quite simple can be confusing if you do not understand there meaning. Well first off Lateral comes from the Latin for side, with pro being from Greek for before something or in front off, and retro being from Latin for backward or behind, so Prolateral is on the side and facing forwards (towards the anterior of the animal) and Retrolateral is also on the side but facing backwards (to the posterior) here again marked the femurs of the leg’s. Refers to higher and lower respectively with the Superior (higher) being that which is closer to the head, but can be used in other way’s were a “head” in the literal sense of as in being a cranium is absent to denote that something is placed higher then a near by structure on the X Y plane. An example of this would be superior and inferior keel’s on the embolus of many male Theraphosids (following Dr Rogerio Bertani 2000) with the Superior keel being placed higher then the Inferior keel when viewed side on as is often seen in drawing’s. 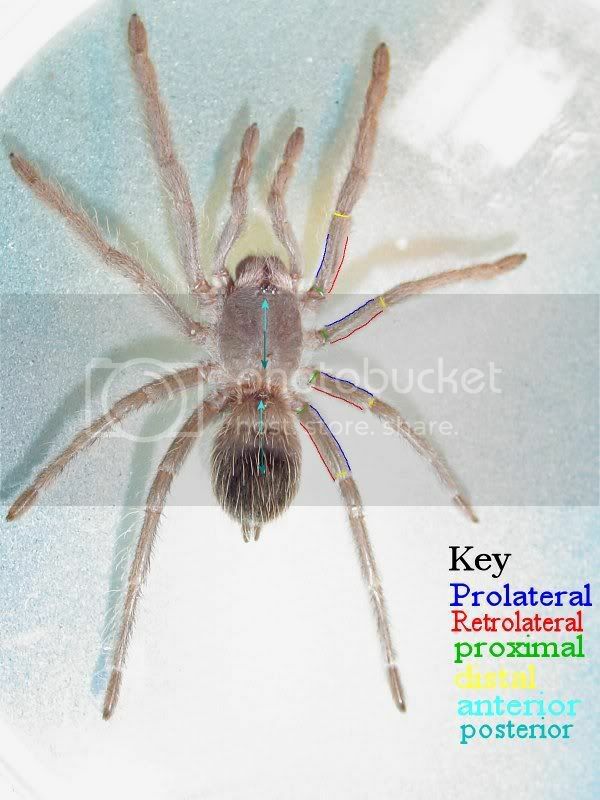 Proximal in the case of limbs refers to the point were a limb is closest to the main body, or in the case of an animal such as an arthropod can be were a segment of a limb is closest to the next segment back I.e. here is marked the base of the femur were it joins the trochanter which is closer to the main body. Distal is the opposite of this being the point of a limb or limb segment farthest from the body and/or the segment behind it, marked here as were the femur joins the patella. Now comes the fun (I use the word fun very loosely) many of these terms can and in many cases must be combined to order to give exact locations when referring to smaller structures like spine arrangements or small patches of setae that differ from what surrounds them. A quick example if this is found in the way that leg spines are marked following the method’s of De Wet & Dippenaar-Schoeman (1991) which use’s in his papers (note there are other method’s of this you will see in papers I use this one here only as an example of how the terms listed here can be combined). If there were two closely related species with a large number of spines on say there tibia of there leg I but there are a few differences in the placement of a few of these which are important in differentiating one species from a it’s near relation, we could simply draw or photograph them and so they can be viewed side by side in a publication. But in order to write this information or explain it verbally then the placement of the spines would have to be given in detail using combinations of the correct terms, i.e if one spine is found close to the end of the tibia on the forward facing side of the limb then it would be “distal prolateral” or another spine of import was found again on the tibia but this time on the upper surface facing back and slap in the middle of segment then it would be “medial retrodorsal” and so on. Hope this has been of some use I have not posted a anatomical chart with this as they can be found online quite easily, although often basic I may do something to illustrate things more specific to Theraphosids or at least other Mygales at a later date. As before any corrections or additions would be great, would have spent more time on this (i just sat and did it tonight ) and exended it much more, but as i was i had been putting it on a back burner for a few weeks . Very nice Job Frylock. That helps us all out here in tarantula cyberspace. Thanks for posting that.